an eel at the Auckland Zoo. The weather forecast was for more rain for most of the week - boo hiss!! Regardless of the weather we decided to check out the Auckland Zoo anyway and contrary to the weather forecast it was fine and humid! The Auckland Zoo was established by the Auckland City Corporation and was officially opened on December 17, 1922. The Zoo focuses on educating adults and children alike about the animals, and the environment by way of information signs along the way and a program called Zoo Encounters. The extensive path network takes the visitor on a journey passed enclosures with Lions, Hippos, Cheetahs, Giraffes, Lemurs, and a number of primates - just to name a few. 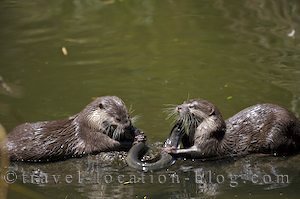 We were even privy to some action with the Oriental Small-Clawed Otters who were fighting over a single eel for supper. The crowds were astronomical, due mainly to the fact that it was still the school holidays, but it was time to "high tail" it out of there and outta town!! We headed straight for the Coromandel Peninsula as the predicted weather started to close in. Once we reached the Coromandel, we stopped in at Thames (the main town for the Coromandel) for supplies before travelling on along the coast. The coastline between Thames and Port Jackson is so pretty with blue water bays lined with beautiful, old and gnarly Pohutukawa Trees still partly in bloom. After a rough 25km drive on an unpaved road with more wash boards than a wash board, we finally pulled into the Department of Conservation campground at Port Jackson and found a level site right next to the beach!